In contrast to this, the idea of Philips Hue does work like this: First of all, your remain seated and make yourself comfortable. Then you take your smartphone, tablet or laptop and adjust all Philips Hue lights exactly as you wish - every single light independently from all other lights. So, one is bright, the other dark, one is blue, the other red - whatever suits you best. In the old days we only had filament lamps. Dimming them, their metal filament became more or less hot and thus more or less bright. That sounds more like a camp fire? Yes. It was one. Sometimes cozy but always nonpractical. Today, we fortunately have LEDs - as for instance Philips Hue. They also can be cozy - but without fire. And, if desired, they even can do it the unpleasant way - if we, for instance, have to stay focused at work. Oh, by the way, Philips Hue also can make your life colorful - but obviously only after work. Via your internet router. Today, it is normal that our smartphone "talks" to the router. Fortunately, we have WLAN (WiFi) for it. But how do Philips Hue lights "talk" to the router? They don't - actually, they have their own router. And to avoid any misunderstanding, it is called bridge. With a bridge, you can simultaneously control up to 50 Hue lights. The lights and the bridge "chat" via a specific form of WLAN - called ZigBee (indicated by a white Z on a blue background in the right part of the drawing). There is just one remaining question: how do your router and bridge "chat together"? Simply via a normal network cable (the green line in the drawing). For your convenience, it is shipped with the bridge. Your smartphone, tablet or laptop talks via WLAN (WiFi) with your router. 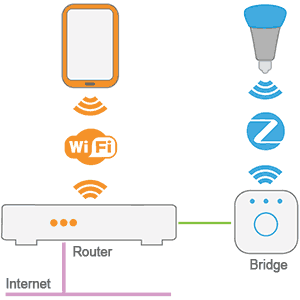 The router talks via a network cable to the bridge, which in turn uses ZigBee to adjust Philips Hue lights. What this detour via ZigBee is good for? ZigBee does consume much less power than WLAN (WiFi). After all we do not want Philips Hue lights to consume more power than normal LED lights. With these simple components you will already get the full "Hue feeling". All other Hue lights are only a variation of this theme. Once you got the components, please proceed here. The brightness of all of these lights can be dimmed. Important: a bridge can be used to simultaneously control up to 50 Hue lights. So, if you have bought a Starter kit, it will be no problem to add any of the lights described in this page - without having to buy a new bridge. In the old days, Philips provided a Lightstrip Starter Kit. Meanwhile, they are outdated. Please note that it is no problem to add a Hue Lightstrip to an existing bridge. These three lamps are not available as a Starter Kit. However, you can add them to an existing bridge without any problem. "Good design is as little design as possible". With Hue Beyond Philips follows this idea of Dieter Rams. 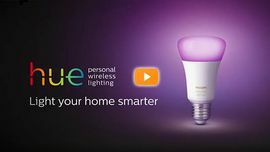 Hue Beyond lamps are not available as a Starter Kit. However, you can add them to an existing bridge without any problem. Hue fulfills the basic human need for light and color with modern technologie. Philips was the first to see this connection. So, it is no wonder that Hue meanwhile is a synonym for LED lighting. Encouraged by this success, Philips introduced over 9 new integrated Hue lamps in autumn 2016. For the sake of clarity we will not do this here, but recommend to have a look at this (UK) or this (US) webpage.